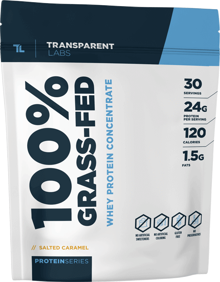 100% Grass-Fed Whey Protein Concentrate is a healthy, less-processed complete protein source harvested from American grass-fed cow milk. Each serving of 100% Grass-Fed Whey Protein Concentrate delivers 24 grams of protein, 1.5 grams of natural dairy fat, and 3 grams of carbohydrates. Since Whey Protein Concentrate does not undergo additional isolation processes, this protein source is still rich in immune boosting Immunoglobulins, cysteine, and the prebiotic Lactoferrin. Now you can enjoy rich and creamy complete whey protein concentrate guilt free, sourced from healthy 100% grass fed cattle. Q: What is the difference between 100% Grass-Fed Whey Protein Concentrate and 100% Grass-Fed Whey Protein Isolate? A: In short, concentrate maintains a lot more of the fat, which in grass-fed proteins, contains healthy nutritious vitamins and minerals. Isolate, has more of the fats removed, providing a more lean, fat-free protein, best for those looking to lose body fat. Both are great, depending on your goals. Q: Can I mix StrengthSeries Creapure HMB with ProteinSeries 100% Grass-Fed? A: Yes. In fact, it’s highly recommended that creatine is consumed immediately post-workout. And because our Creapure HMB is flavorless, it tastes great when mixed with our protein.